During this time, Gee Ray received the opportunity to tour aboard with a Los Angeles based show group called Starfire under the direction of Mavericks Flat International. Gee Ray has also toured and performed overseas with various show and dance groups, such as Ashantis, an Afro disco recording group, under the management of Romolo Ferri, for a period of 4 years. Gee Ray has over 19 years of experience in the audio digital recording field, which involves two types of hardware. Computers with wave and midi recording software, and electronic keyboards with digital sound processing, better known as DSP. Today, Gee Ray incorporates both the Electronic keyboards and computers to give him the maximum opportunity in creating the best possible digital sound recording. 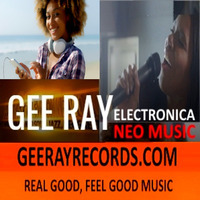 Over the past 21 years, Gee Ray has written, recorded and produced 5 Cd's under the label Gregory Ray Records. He has collaborated with many local recording artists such as: Papa Bear, Big D, Lil Dub and A R Base. He has also mastered many songs for various recording artists in the Riverside, CA area. Gee Ray subscribes to several websites to stay abreast of current music industry trends, and is a member of Sound Exchange and ASCAP as both a Writer, Performer and Publisher.